At last year’s CeBIT, the Swiss technology start-up oneclick AG announced the launch of the Application Delivery and Streaming Platform of the same name. 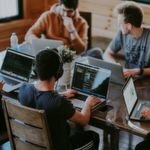 The platform, which enables delivery of applications from any server location as a stream in a central, 100% web-based workspace in the browser, was developed due to previous recurring issues experienced by the founders. Over and over again, they had the problem to make centrally hosted applications available to staff in distributed locations – performant, secure and correctly licensed. First of all, there was a vision, which led to many discussions with users and subsequent beta tests, until the first version of the oneclick platform was developed. Known in the start-up scene as a "Minimum Viable Product” which is a product that fulfils minimum requirements and features of concrete customer needs, this has now turned into a rounded, operational tested and highly valued solution, expanded by diverse modules and features. For example, last year it was only possible to stream and control applications from any source to any device. In the course of this year, this could be complemented with data and print jobs. A strong unique selling point of the platform is that no software components of oneclick need to be installed for remote access to servers and devices. Immediately, the platform is available to use for anybody and communicates directly with all common remote, terminal and web protocols. It started with RDP, but now the platform has been expanded with SSH, VNC, telnet and HTTPS. Any destination infrastructure can now be connected, which operates one of these protocols. Generally, these are Windows, Linux and terminal systems as well as websites. Using oneclick, applications from on-premises locations can be delivered just as simple, quickly and securely in a workspace in the browser as services from private or public cloud. The workspace design has now also been completely renewed. The workspace should not only be efficiently operable, but also have an attractive look. Staff productivity increases by single sign-on to all applications, a central web file share as well as a so called multi-stream view. This technology enables, for the first time, the display of several windows and/or streams on one single webpage simultaneously from different connection targets. In this way, users can work with several connection targets in parallel. Even copy / paste between the streams is possible. Response times also offer no issue for the workspace in comparison to a traditional, local desktop. The in-house developed streaming protocol manages with low bandwidth and is optimised to keep latency time low when accessed remotely. The workspace is protected by a highly secure authentication and delivery procedure, which isolates the connected destination systems like a lock from the internet. The platform contains diverse intrusion detection and prevention as well as DDoS attack prevention systems. For a low and manageable amount per user and month, small and medium sized enterprises (SMEs) have access to a security architecture from the corporate environment, without having to invest themselves. One year ago, oneclick was still supplying its SME customers. Meanwhile, the company has a two-tier channel approach for this business segment. Large and specialised distributors were found in ALSO and Vanquish, that can market the platform to systems integrators. These systems integrators can then deliver their own applications and services via the platform as a “Managed Service“ and integrate existing systems of their end customers at same time. This integration of applications from various sources in one central platform creates a considerable added value. This is made possible through a sophisticated remote app broker engine, which enables systems integrators to self-configure and subsequently automate processes to the greatest extent feasible. It is possible to select own colours, icons and graphics as well as stipulate different connection types for the delivery of remote apps in a user workspace. The platform‘s multi-client capability allows a systems integrator to provide individual applications or tailored Desktops-as-a-Service for every customer and even customised for each user. Since last year, oneclick AG was able to attract a three-digit number of systems integrators, who have successfully included the platform in their portfolio. oneclick AG has its head office in Zurich, Switzerland and an innovation centre in Prien, Germany. The company is specialised in the development of a platform for automated and secure provision of digital workspaces. Oneclick AG's objective is to be instrumental in the design and improvement of End User Computing. 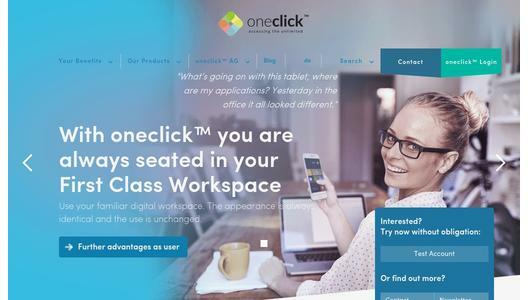 oneclick AG was founded in 2015 and has 25 employees.